I have another recipe today, but first, a semi-apology: I hope you're not sick of recipes. I totally don't want this to turn into a food blog. But, truth be told, I don't have too much else going on these days - it's pretty routine, though I'm not complaining about it ... I eat well, I stay active, I sleep well, and I go out with my friends. Which is not to say my mind has slowed down at all, or that I'm any less introspective about the journey I'm on. I guess the things I'm considering right now are all really big, and they need a bit more time to process. I've also written a lot of personally emotionally heavy posts lately, so this is a nice break, I think. I post here daily to keep myself accountable and to keep a personal log of what I've done so far, and some days, all I really accomplish is cooking a healthy meal or three. This week has been one of those weeks. My best friend Jill also has a blog where she writes about photography and a fabulous random smattering of people, places, and events. Since she moved into her first apartment, she's been exploring cooking for herself, and her photo posts on Facebook always inspire my own culinary ventures. Unfortunately for me, though, not all of her recipes fit within the plan I have set for myself and my eating. Mango BBQ black beans - good. Zucchini bread - bad. Bad to the bone. Zucchini bread is a serious childhood memory for me - my uncle John used to make it all the time, and I can still taste it to this day. I have the only handwritten copy of his recipe, and someday I'll make it - but for now, things like that aren't safe for me. It's not that I can't have it, it's just that I don't feel strong enough to trust that I'd only eat one piece. It's just easier to say no at this point, and when an occasion comes up where I need to cook for a group, I'll make it and enjoy a slice responsibly and remain in control. Holy moley, were they good! They could easily have made two servings as 175-calorie sides, but I definitely ate them all for a 350-calorie lunch. Preheat oven to 375º F. Whisk together egg and egg white, 2 tsp. of pumpkin pie spice, and 1 tsp. of brown sugar. In a separate bowl, combine breadcrumbs, 2 tsp. of pumpkin pie spice, and 2 tsp. of brown sugar. 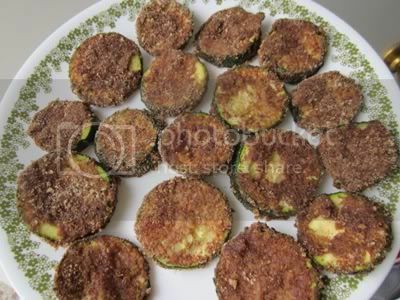 Dip the zucchini chips in the egg mixture, then coat with the breadcrumb mixture. Place on a cookie sheet and bake for 18 minutes, flipping after 8 minutes. Remove from oven and let cool for 2-3 minutes (they will crisp up a little). Mixing the sugar and spice in with both the egg *and* the crumbs made it look extra brown without being too thick with bready coating. You could certainly use all egg whites or egg substitutes. Also, I used pumpkin pie spice only because it's what I had in the house - you could use a mixture of cinnamon and nutmeg if you'd like. Close enough to zucchini bread to be delicious, yet far enough away to avoid triggering anything. I'm extremely pleased with this little recipe I invented! Mary - this recipe looks AMAZING!!!! Love that you are sharing so much delicious foods!!!! I just started reading your blog and I love the recipes! Pumpkin pie spice? I would have never thought to use it. Then again, I've never made zucchini bread. As of today I have 16 zucchini and yellow squash blooms open. I did not count the number of closed blooms. Lets just say in a month I will be looking for new recipes to try and this one will be on my list. THAT is a very creative recipe! Love that I found it, and I will be trying it sometime soon! oh Yum!!! These sounds delicious! 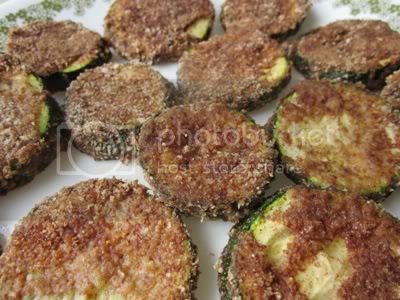 I would have never thought to make a desert-ish zucchini "fry". SO Trying this one soon! I have just started following your blog and I love reading recipes! This one sounds awesome!!! This is a great idea! I will definitely be trying it soon. Thanks! I like it when people share recipes and food pictures. I get some great ideas from them especially since I follow a lot of people who are on a weight loss journey. I am not much in the kitchen so I like to keep things simple. Yesterday my friend posted a picture of her salad and I knew that I needed to make it. Here is the recipe if you want to try it... it was so good & filling. Wow those sound amazing!! I will have to try those! Thanks for sharing. I saw this yesterday and then got distracted by Jills photography and ambled away without commenting! I am glad that this is a decent sub for you. And very creative! I bet that breadcrumb mix would be good on sweet potato disks put in the oven. Oh my word! These look AMAZING! What a great recipe! I can't wait to try them out!